I liked this. A lot. Certainly more than I might have expected given the string of lukewarm reviews. I liked the way the important story was told, the structure, a later generation revisits and is shaped by its shared history, the three believable relationships that lie at the heart of the play, the way director Joe Harmston and designer Sean Cavanagh, (and a punchy contribution on sound from Matthew Bugg), made very effective use of the SP’s larger space, in transverse, to convey changes in time and place and, especially, I liked the committed performances from the cast of seven. James Phillips’s play is based on the life and, still contested, crimes of Julius and Ethel Rosenberg. 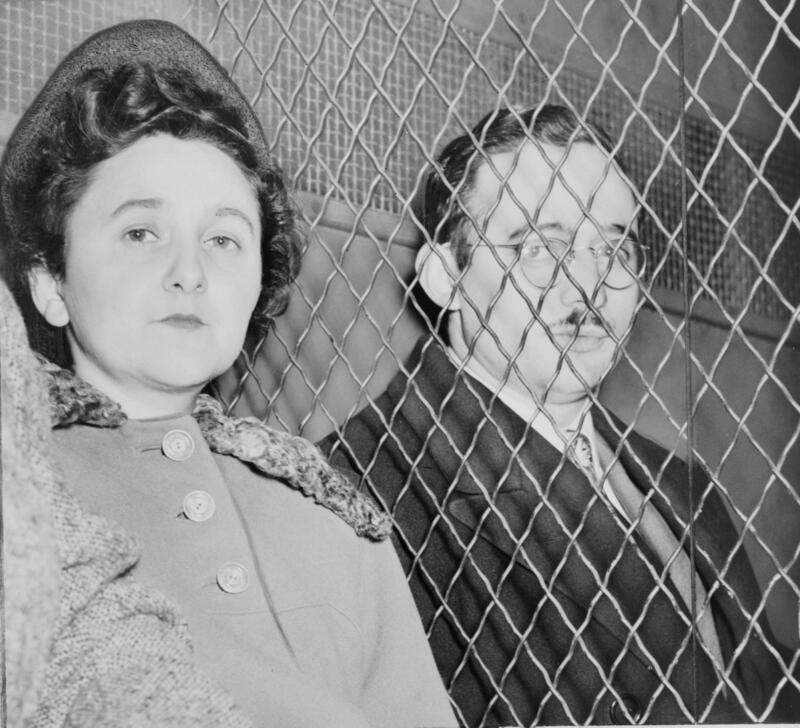 The Rosenbergs were convicted and executed in 1953, at the height of the Cold War, after spying for the Soviet Union, allegedly having passed secrets about nuclear weapon design secured by Ethel’s brother, David Greenglass. The play disregards the trial itself, focussing instead on the early lives of the Rosenberg’s and Greenglass’s, the interrogation of Julius Rosenberg and, in a constructive framing device, the attempts in later decades to clear their names after the executions. Katie Eldred (a splendid stage debut performance) plays history teacher Anna Levi who meets lawyer Matthew Rubenstein (a similarly persuasive, if occasionally overly clamorous, Dario Coates) at an exhibition in 1970s NYC where he is staring at an iconic picture. It turns out that this is his parents kissing, (there is a similar image of the actual Rosenbergs, though the above is the most reproduced). I don’t think it is giving too much away to say that Anna and Matthew have a connection beyond the sexual relationship that follows, namely that he is the son of the Rubensteins and that she is the daughter of David Girshfeld (Sean Rigby) and Rachel Liebermann (Eva-Jane Willis). We go back in time to the small apartment where the earnest Jakob Rubenstein (Henry Proffit) and his spirited wife Esther (Ruby Rentall), who gave up a promising singing career, first set up home and bring up Matthew. Having left the army, where he worked in the nuclear bomb testing facilities in Nevada, (at a time when only the US had this technology), David is invited by Jakob to join his electricals business, allowing David and Rachel to also have a child, Anna. We see how Jakob and Esther’s upbringing, a child of the Great Depression, education and Jewish heritage inform their Communist idealism and sympathy for Soviet Russia (as did so many of their class and background did at the time). We also discover how Jakob was fired from his job as an engineer at a New Jersey facility which carried out research on missile systems for the army because of his CP membership. In a series of flash-forwards, sometimes acted out in parallel, we also see how Jakob refused to renounce those ideals and confess to his crimes of espionage even when facing trial and under interrogation from FBI agent Stephen Cranmer, a man of considerably more complexity than you might expect, required an appropriately nuanced performance from Stephen Billington. And we see how and why David turns against Jakob and Esther, confesses his own involvement and implicates Jakob as the head of a Soviet spy ring. We also return to Anna and Matthew whose relationship is transformed by the revelation of their shared parental history and by Matthew’s involvement in the campaign to clear his parent’s names. All this seems to follow much of the actual Rosenberg case, though we don’r really get to understand what exactly the Rubensteins, and David, did, nor, convincingly, why. Nor the events that have unfolded in the last couple of decades which point to the guilt of the Rosenbergs and have changed the way in which the cause celebre is viewed, now focussed on whether the punishment was appropriate to the crime. This is more about the relationships at the heart of the events, embellished and re-imagined, and all the better for it. There may well be another play located in the arrest, indictment, (the way the Greenglass’s changed their evidence is much simplified in TRK), trial, conviction and execution but it might not work effectively as drama and would be pretty thorny to grasp. There have certainly been other dramatic treatments of the people behind the facts on stage as well as film, though I can’t vouch for any of them. As an aside Roy Cohn, who later went on to play a leading role in the McCarthy trials and act for the Trump family, was involved in the Rosenberg prosecution case. And, as all good students of theatre will know, his particular brand of amoral, wanker-ism was spectacularly aired in Tony Kushner’s epic Angels in America. So James Phillips has packed a lot into his award winning play which by and large works. This is its first revival following its premiere in 2006 and it is easy to see why Joe Harmston and the Devil You Know company alighted on it. I am happy to forgive Mr Harmston for his hyperbolic comments about its relevance to the “end of days apocalypse of division” we now face. Threats to the enlightened consensus are permanent and democracy always fallible. And, from what I read, there is much to debate around the “rights and wrongs” of the Rosenberg case. But, as drama, this really worked for me. When I fill in one of those stock surveys the major theatres send out to us regular attendees I always tick the “I want to be educated” and “I want to be entertained” boxes. Job done here. On both counts. OK. So I might have oversold this one. It is still Caryl Churchill. With that extraordinary opening act. And that carefully calibrated feminist message, as relevant now as it was when it first appeared in 1982, of how to balance “success” in work and as a mother. The argument between collective and individualistic strands of feminism. To ape the patriarchal norms or to reject them. But as an introduction to the greatest living playwright in the English language? Maybe this wasn’t the production. So profuse apologies to those most faithful of the Tourist’s recommendation followers, BUD and KCK, who came along. And to the most long suffering of all, in so many ways, the SO, whose previous CC exposure was the brilliant (to me), but admittedly knotty and OTT, production of Light Shining in Buckinghamshire on this very stage in 2015. I hope my chums could see where I was coming from even as the flaws in the production became apparent. Not that these flaws were substantial. The opening scene here has a cast to die for, Siobhan Redmond as the indomitable Isabella Bird, Amanda Lawrence as the ebullient Pope Joan, Wendy Kweh as the enigmatic Lady Nijo, Ashley McGuire as the laconic Dull Gret and Lucy Ellinson as the most obviously misused Patient Griselda. The way CC takes Marlene’s drunken dinner party celebration and transforms it into a confessional which explosively, hilariously and movingly transcribes the fate of women, real and fictional, across time and geography, and specifically the way the patriarchy determines their roles as mothers, is still, for me about the most riveting half hour of theatre I have ever seen. Especially when the technical challenges of the multiple, simultaneous, conversations are, as here, perfectly realised, not to say the getting pissed part. And all presided over by the dauntless Marlene about to take the top job at the Top Girls employment agency. Katherine Kingsley, who you will probably know best from her musical theatre roles, initially locates Marlene firmly in the 1980’s Thatcherite, “ballsy”, power woman mode. To watch her equivocation, and Suffolk accent, emerge in the later scenes is a measure of just how good a performance this is. The second scene, (here the usual order is shuffled a little), sees stage debutant Liv Hill, (Three Girls, on the telly, just watch it – though for my money Ria Zmitrowicz is actually the best of the trio of talent on display), initially at least, convincing as the immature Angie, sharing her angst with younger chum Kit (Ashna Rabheru). The two actors are confined to a small box room stage right as the technicians crack on, quietly, with transforming the space behind. Into ….. the Top Girls agency. Which is where the full glory of the period detail of Ian MacNeil’s set and Merle Hansel’s costumes, (so superb for the dinner party), are revealed. And which also highlights one of those modest flaws is the production. By anchoring the look of the play so firmly in the year when it was written it encouraged the audience to do the same. The universality of the messages were diluted. Those of us who are old enough to recall the period, (all the Tourist’s party I am afraid), were drawn into thinking about the archetypes and behaviour of the period rather than the wider issues examined in the play, and I suspect you younger folk will have been affected more by the story here than its implications. For it is, especially as we turn into Scene 4, and the not so big reveal, a mightily powerful piece of drama, especially when actors of the calibre of Ms Kingsley, and Lucy Black as her sister Joyce, are charged with delivering CC’s brilliant text. I don’t suppose I will ever tire of the thrill of listening to Ms Churchill’s dialogue. Complex and ambiguous ideas, observations and dilemmas framed in entirely natural dialogue, (even sometimes when how it is framed is formally inventive or even, frankly, a bit weird). There is so much dialectic revealed in Marlene and Joyce’s final argument that it is hard to keep up and yet it also sounds and feels exactly like the kind of set-to that any sisters might have had, at least in the modern world, about family, choices, dreams and disappointments, as well as politics. Family and/or career. Collective and/or individualistic feminism. All in less than half an hour. And yet, as many critics have observed, this production, because the NT could, by not having actors double up from the first scene into the office scene, loses much of its resonance. CC didn’t specify doubling. That is just the way it has generally been done, a cast of seven for the simple reason of cost. But it certainly, at least when I have seen the play before, has far greater impact as the women that emerge from the interviews, Jeanine, who just want to travel and be with her husband, Louise, who has devoted her life to her job but still watched men promoted over her, and Shona forced to exaggerate her experience, as well as Mrs Kidd, who comes to plead for husband Howard who had expected to get the job Marlene has secured. This pivotal scene loses some impact because of the introduction of new faces, (the SO observed that she was expecting the dinner party guests to reappear in new guises and she has never seen Top Girls before), and maybe because, in an attempt to fill the Lyttleton stage, there is a fair bit of superfluous movement and furniture in this agency scene. Director Lyndsey Turner, unsurprisingly given her experience in reviving Caryl Churchill’s work, pretty much nails the words, from Marlene’s initial instructions to the waitresses at the restaurant, (of course they are women), through to Angie’s final, plaintive, cries for her Mum at the end. This is such a rich play, just read it, and, with a cast of this distinction, the words can’t help but leap from the page. It is just that the look and feel of the production, even with the solid contributions of Jack Knowles (lighting) and Christopher Shutt (sound), didn’t quite work for me. Still to watch 18 women, (many of whom, in the “lesser” roles, were new to me), line up across the stage at the curtain call was pretty awesome. I doubt I will see that again. I don’t doubt though that I will get another opportunity to see Top Girls. The programme lists 25 English language productions since the Royal Court premiere. With 6 last year alone, (though its been 8 years since the last major revival in the UK from Out of Joint). That’s the thing with Caryl Churchill. She changes the game whilst being ahead of it. Composer Iain Bell and his librettist Emma Jenkins wanted to call this just The Women of Whitechapel. Some marketing types at the ENO decided it needed to be prefixed with the title of the infamous murderer, charitably I suppose to let the potential audience know its subject. Worse, to continue the tiresome obsession with perpetrator and not victims. For this opera is specifically written about the women who were murdered. The murderer does not appear. Shame then that the creator’s original intentions could not have been fully honoured. Mind you I see that some bozo US deathcore band has appropriated the grotesque misogynistic fixation at the heart of this story by calling themselves Whitechapel. The band are in their 30s. Grow up lads. I was predisposed to this new opera from the start. And I was extremely impressed with the end result. I see some proper reviewers who, to be fair, know their opera unlike the Tourist, think the opera is lacking in dramatic impact. I disagree. Yes there is no central single heroine to latch on to, there is no narrative arc towards some sort of tragedy or redemption, there are a fair few characters, the overall feel of the piece is dark and it is made up of a procession of set pieces. But that reflects the story of the five women that Mr Bell and Ms Jenkins wanted to tell, (based on scrupulous research where possible as well as some leaps of imagination). For me it was very powerful and very involving throughout. I also accept that some of Iain Bell’s music and the way in which Daniel Kramer directed many of the scenes verged, on occasion, towards Les Mis style caricature, though this is no bad thing in terms of the immediacy of impact. However the more obvious inspiration might be Britten, Peter Grimes for the tone of the piece, and Death in Venice for the musical colouring. Worthy template. Mr Bell does not have BB’s compositional facility but the mix of solo and ensemble pieces, the set pieces with chorus, the unusual instrumentation, (the eerie elastic tone of the cimbalom to signify the presence of the murderer for example), the shifting in and out of tonal and more dissonant, atonal music, all conjure up a similar atmosphere. The opera is centred on the last of the known victims, Mary Kelly, superbly sung and realised by Natalya Romaniw. Mr Bell and Ms Jenkins have created roles specifically for the mature voices of some ENO big stars, namely Marie McLaughlin (Annie Chapman), Janis Kelly (Polly Nicholls), Susan Bullock (Liz Stride) and Lesley Garrett (Catherine Eddowes), as well as the redoubtable Josephine Barstow as Maud, the proprieter of the doss house where the women are forced to live. The illustrious cast is further enhanced by the presence of Alan Opie as the aloof Pathologist who carries out the autopsies on the women’s bodies, Robert Hayward as the compromised Chief of Police and Paul Sheehan as the intimidated Coroner. From the current ENO vintage Nicky Spence provides a lighter touch as Sergeant Strong, James Cleverton is a Photographer with dubious intentions, William Morgan a rather underwritten, reformist Writer and Alex Otterburn is Squibby a local butcher’s boy. On the evening I attended Sophia Elton also stood out as Mary’s voiceless daughter Magpie. Soutra Gilmour has conjured up another striking set, though it is sombre and dark, (and a bit Goth), in line with the mood of the piece, which is sufficiently versatile to persuade as doss-house, pub, street, mortuary and funeral procession for the coup de theatre of the, slightly over-long, ending (in which Paul Anderson’s lighting design, literally, really shines). Martyn Brabbins’s enthusiasm for the score and the commitment of the ENO Orchestra was never in doubt even in the slightly padded passages. I think the opera makes its points about the callous way that the patriarchal society of the day treats these poor women – the murderer is simply an extension of the more “respectable” men that abuse them – the solace and support they take from each other and their overwhelming fear as the threat mounts. On its own this work cannot counter a century of writing out the victims as the expense of the sick fascination with the male perpetrator, (turn on your TV any night of the week to see that is still par for the course), but it is a brave, ambitious and engrossing attempt to do so and to provide a valid three hours of musical theatre. The symbolism, the Minotaur metaphor, the male chorus poking through the windows of the doss-house, the final ascension, is thought through and adds texture to the naturalism of previous scenes. The more poetic passages in Emma Jenkins’s libretto similarly contrast with the vernacular episodes. I read a fair few reviews in thinking about this. They were all written by blokes. There were, with few exceptions, wrong about this. Presumably they would have been happier seeing yet another production of that scrupulously unmanipulative tale of female agency Madama Butterfly.